WILLEMSTAD - Have you ever met somebody that is just one of a kind? 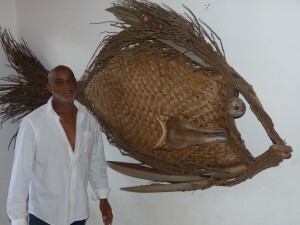 Well, wait till you meet this Curaçao artist named Jampito Landbrug. Jampito Landbrug an artist inspired by Coco Trees to create a whole zoo of incredible creatures, very charming and creative. You won’t believe your eyes, the animals he can fashion with coconuts, fronds and leaves. In a conversation with Jampito, he indicated that his idea to start working with coconut trees and other palm trees came when he had a vision of all the possibilities with this type of plant. “I keep seeing shapes, contours and forms in my mind. Once I have an inspiration, I will find the right parts of the palm tree and make my art,” said the artist. He has his way to see things and he transforms that into art. Jampito also has a young student who comes to his workshop. And this student tells him that when his teacher erases whatever she wrote on the blackboard, he sees shapes which he later translates into this type of art. “I told him that he had to take a piece of paper and a pencil to draw what he sees.” This is how the artist is helping the future generation to continue with his work. 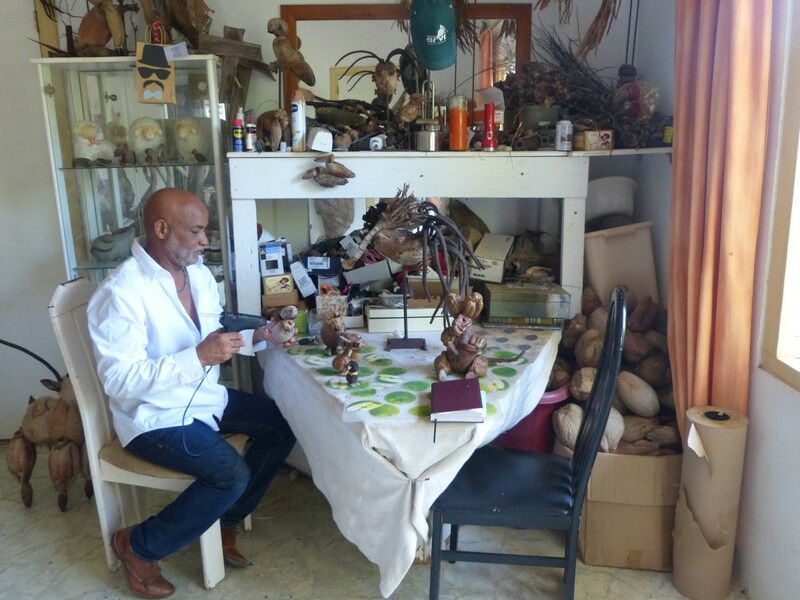 He has done several workshops including in Bonaire but according to the artist, people here in Curaçao are slow to catch up with this type of work. 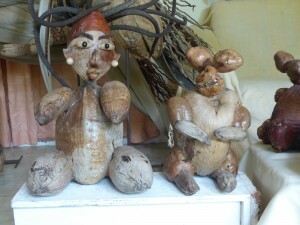 The people in Bonaire were more eager to learn and to do something with this type of art to make a living. “I don’t know what is going on with our people. I had a group of young women who contacted me but I haven’t heard from them ever since,” said Jampito. Jampito has been doing this since 2011 after he returned from the Netherlands. He wants to be full time in his shop but since he has another business of selling palm trees that takes a lot of valuable time he could be spending making more art. Jampito says that he has come now to a point where he can make just about anything with coconuts and palm trees. “Basically I can make anything. I just made a turtle which was a special request. He is working on that request which will soon be finished. It will be displayed in an office building on the island. His motivation comes when he sees how people react to his art. Especially tourists who look him up to buy his work. 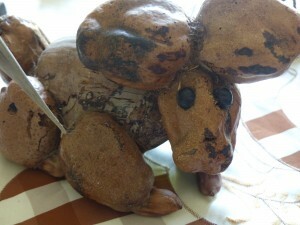 Jampito can be contacted through his Facebook Page or during any special markets on the island.